Description: 24"x20" acrylic on stretched canvas, signed and dated '06. 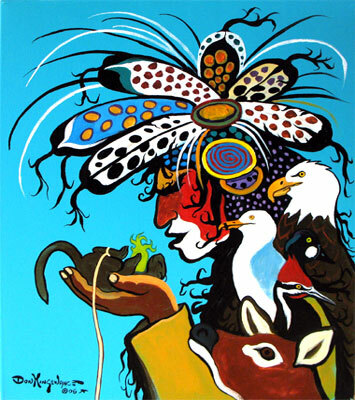 This is original art for the cover of upcoming book on Legends of The Lac Seul Ojibway. In this legend Weeskayjak makes a great raft and puts all the animals on it to survive The Great Flood. After the deluge, he calls upon the best diving animals to retrieve some moss from the bottom to start over. The Otter, Beaver, and Mink all fail. Then a small Muskrat offers to help. Weeskayjak ties a tethering line to the muskrat's leg to retrieve him if he drowns. When the line goes limp he pulls it in to find the little muskrat has died but clutched in his paws is a piece of moss. Weeskayjak holds the muskrat in his hands and gently blows life back into it. The muskrat revives and the moss starts to dry. The Great Waters start to recede and soon the tops of the trees start to show. The Land is once again restored to its original state.